Enjoying this best northeast Vietnam motorbike tour gives you the opportunity to explore the magical region of the far northeast with its impressive limestone karst scenery. You will meander around and through the countless rock monoliths all the way to Ba Be National Park or the huge Ban Gioc-Detian Falls which sits on the Chinese border. Nothing is more perfect when the final destination of this motorbike tour is Ha Long Bay, a World Heritage Site! You will be accommodated in homestays and hotels. You will start this northeast motorbike tour by riding on to dike roads following Red River to Thac Ba Lake. You will see the beautiful countryside, rice, and green tea fields. Then, you will turn to the little road to Vu Linh village, populated by Dzao ethnic minority by the side of Thac Ba Lake, very friendly people and the welcome is exceptional. Homestay will be in Vu Linh. Today, you will have an offroad motorbike tour to tribal villages. It will be an easy motor riding day. You will get more chances for photos in Tan Trao and Cho Chu. Tan Trao Historic Site is a small valley lying between mountains and jungles in Son Duong District. It was used as a resistance base before the August 1945 Revolution. It is also where the Indochina Communist Party first carried out the National Congress (13 August 1945). At the National Assembly held on August 1945 in Tan Trao, the great policies of Vietminh were drawn and a temporary government led by Ho Chi Minh was elected. Cho Chu Monuments prison is on the hill in the neighborhood Chu Cho township, Dinh Hoa district, Thai Nguyen province. In 1889, the French occupied the station has built robots. In 1894, they put the agency ruled this area agents. It was conducted in 1916 to build prisons until 1945. Cho Chu Monuments prison is a vivid symbol for which the revolutionary soldiers are willing to devote life, sacrifice fighting for independence and freedom of the country. You will keep riding on the beautiful road to Na Khan, where you will stay with the locals. This Nung's village is in the middle of nowhere. Today, you will enjoy an off-road motorbike tour to hill tribe's villages. You will take a half day motor ride in the morning through Ba Be National Park. Ba Be National Park is an abundant bio reserve area containing the world’s only fresh-water karst lake and several rare species of fauna and flora. Ba Be Lake, the biodiverse of a 10.048-hectare park, is home to 1.268 species of flora and fauna, a series of caves, and a gigantic fresh water lake. It was established in 1992 by the Vietnamese government to preserve forest ecosystems in the northeast. Ba Be is home to over 3.000 people from the ethnic minorities of Tay, Nung, Dao, and Mong, who live in 13 villages within the park. The Tay people have inhabited Ba Be area for centuries and make up 58 percent of the population within the park’s boundaries. You will ride into Bac Ngoi village, where you will have lunch and homestay. It is located inside Ba Be National Park. Your homestay in Tay's family is right by the side of Ba Be Lake with a wonderful and peaceful view. In the afternoon, you will take a boat ride on Ba Be Lake to the other side, where you can explore Dau Dang Waterfall on Nang River. As one of the 27 ASEAN Heritage Gardens, Ba Be has the potential to attract nature lovers with its 450 hectare natural fresh water lake and 553 species of mammals, birds, reptiles, amphibians, and fish. According to a survey from the Vietnam Institute of Geosciences and Mineral Resources, over 11.000 years ago, an earthquake caused a collapse of the subterranean Nang River, creating a natural dam which led to the formation of Ba Be Lake. On this day, you will have an offroad motorbike tour to tribal villages. Taking a motor ride through Ba Be National Park, you will get out to Cho Ra and then turn to head up the Cao Bac Pass, offering breathtaking views of the surrounding countryside. Increasing the pass, you will be able to see hillsides carpeted with apiaries, Vietnam's most famous honey-producing areas. You will motor ride southwest to Cao Bang and breach several passes on route in an area hosting huge mountain scenery. Overnight will be in Cao Bang. Getting out of town, you will ride up to Ma Phuc Pass of Cao Bang Province. It is on the way between Cao Bang Town and the Ban Gioc Waterfall. The pass is not famous with the elevation or the danger like some others in Vietnam but with the natural beauty that one could capture from the top of the pass. You will keep riding to Ban Gioc Waterfall, one of Vietnam’s best-known waterfalls. It’s a very scenic spot, marking the border with China, but sees very few visitors. The name Ban Gioc is derived from the Montagnard languages spoken in the area and is sometimes spelled Ban Doc. The waterfall is the largest, although not the highest, in the country. The vertical drop is 53 meters but it has an impressive 300 meters span. One end of the falls is in China, the other is in Vietnam. The falls have three levels, creating a sort of giant staircase, and there’s enough water anytime, most years, to make the trip worthwhile. You will have lunch at a local restaurant before you get another way back to Quang Uyen. This is the territory of Nung An people. Homestay will be with a host family and the hostess is a great cook. This could be the best ride ever. Overnight will be in Quang Uyen. This will be a motorcycle tour from Quang Uyen to Lang Son on the famous historical Highway 4, passing Dong Khe town, Battle of Route Coloniale 4. The Battle of Dong Khe was a major battle of the First Indochina War. The fight began on 15 September 1950 and ended on 18 September with a French defeat. It took place in Dong Khe, in the Province of Tonkin, Vietnam, from September 15 to September 18, 1950, ending with a Viet Minh victory. You will be arriving at Lang Son at noon. You will have a late lunch before time to discover this city which has become a big trading post between China and Vietnam. You can shop for cheap Chinese products at the nearby Dong Kinh market. Overnight will be in hotel. You will begin the day with an easy morning on motorbikes back on the new Highway 1B before turning on Road 18 head to Ha Long City. Traffic will be busier because you are going to one of New 7 Wonders. Overnight will be in a hotel. You will have free time in the morning until you enjoy a group to cruise on Ha Long Bay. It will be time to make friend with customers on the boat and party for a boat sleeping night. Lunches, dinner, kayaking, and cave visiting are included. Overnight will be on boat. You will be cruising back to Ha Long tourist wharf by another way. Passing Bai Tu Long Bay, you will see another charm of World National Heritage. After lunch, you will jump on your motorbike for getting back to Hanoi. This tour will take you from Hanoi to Ha Long Bay. Along the way, you will visit Thac Ba Lake, Na Khan, Ba Be National Park, Cao Bang, Ban Gioc–Detian Falls, Quang Uyen, Lang Son, and Bai Tu Long Bay. You will have 6 breakfasts, 9 lunches, and 8 dinners. Fruits and coffee on roads are also provided every day. You can shop for cheap Chinese products at the Dong Kinh market on the sixth day. 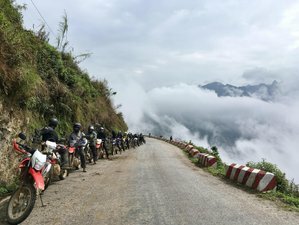 Indochina Motorbike Tours is a destination tour company with experienced guides and qualified experts in the tourism business, both in and outside Vietnam. This tour is available all year round except during Lunar Tet Festival (January 25th - February 10th, 2019). The surcharge for manual dirt bikes of 150cc and 250cc 18 USD / bike / day and 30 USD / bike / day respectively. The supplement for those who want to stay in single rooms throughout the trip is 190 USD per person. Bigger groups (more than 2) can be accommodated. Kindly send an inquiry mentioning how many persons you are for an accurate price offer. Please note that this tour is offered on a private basis. It caters to a single rider or to a private group, providing a personal tour guide in either case.